I was through my planner the other day and saw that my first spread was in August. Then I looked at the dates and I realized: I’ve been using my planner for a year now! It was so strange to think about how a year has already passed, so I decided to make a post to chronicle how much my planning style has changed in just one year. Take a look down below! This week was awful, but looking back at it, it was so terrible it was hilarious. But thankfully I have amazing friends and family to cheer me up. Read about this week from Hell down below! This week has been crazy. I’ve had nearly no time to relax, sleep or work on this blog. And for that I’m sorry. I pride myself on getting three posts out a week, but that didn’t happen last week. Hopefully this week will be better. A lot happened this week and man, I can’t wait to get into it. This week was spent relaxing and in a bit of pain after I got my wisdom teeth removed Wednesday. I got some reading done and some new stickers too! I started a new job this week and got a cavity filling. FUN! Y’all know the drill with these now. Let’s get on with it! 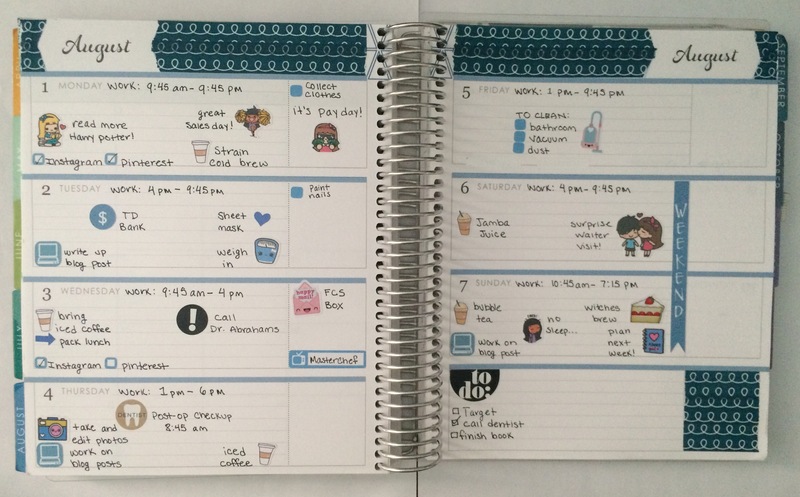 This week was busy and my planner shows it! This is also one of my favorite spreads. I love all of the stickers! This week was super busy filled with work and workouts!